Here’s another character you’ll meet in Auztralia, SchilMil Games’s game about the late discovery of Australia in a world controlled by the Great Old Ones. Juliet Verne and her airship sure are handy to have around when combat starts. 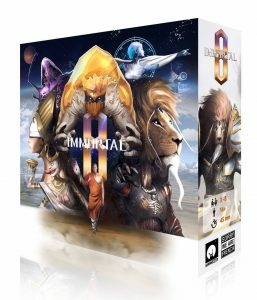 French publisher Sorry We Are French – a great name, and nothing to apologize for – have started previewing Immortal 8. The fantasy civilization drafting game is quick – eight minutes per player – and although each player only plays five heroes, buildings or wonders the whole game they say there’s a lot of variety in the game. I’m curious what the other seven preview posts will bring. Because of course there’s supposed to be eight of them. The first thing to notice on the Everdell Kickstarter page is that it’s beautiful. The next thing is that the world of intelligent animals living in the safe valley under the Ever Tree is charming and imaginative. And then you get to its qualities as a game: tableau building and worker placement will always get me interested. The workers in Everdell go out to gather resources that you need to add cards to your tableau. The cards represent buildings in your settlement. The space there is limited, so you’ll want to pick cards with synergies. To give you some direction there are eight events in every game to work towards and score points. A very light and peaceful game, but with strategic bite. Let me check my list of things that should have a boardgame… yup, Hellboy is on it. Mantic Games are going to launch a Kickstarter for a cooperative Hellboy boardgame in April. There’s not much else to say about it for now. You’ll play as some of the comics heroes, face off against some of the villains, and there’ll be miniatures with the look of the comic books. More details about the game are sure to follow soon. When you have a really good core mechanism in your game then you can always find new ways to spice it up. Point in case: Catan. Even with all the variants already out there, new ones are still exciting news. The latest one is Catan: Der Aufstieg der Inka (translated: Rise of the Inca), a design by Klaus Teuber and his son Benjamin. The setting is just what the title says, the rise of the South American Inca culture. Mechanically there’s something new in this game that never happened in a Catan game before: your settlements are not forever. Nature reclaims the things you build and gives your opponents the chance to resettle the location. This new displacement mechanism will make it a very different Catan game. 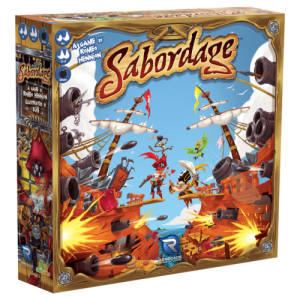 Sabordage, A quick pirate card game is the latest game announced by Renegade Game Studios. On his deathbed Captain Blackbeard gave the location of his fabled treasure to all other pirate captains – the players. So build your ships, go to sea and sink everyone in your way. Both the ship building and the fighting are part of the game, with the drafting and placement of ship upgrades playing an important part. In February Alderac will launch a Kickstarter for Edge of Darkness. The game has a delicious mix of mechanics, and “the most ambitious tabletop game [Alderac] has ever published” doesn’t sound like an overstatement. Edge of Darkness is a design by John D. Clair and inherits the card crafting mechanism from his Mystic Vale. It even takes the idea a step further: the up to three cards you sleeve together have a good side and a bad side, and by buffing a card’s good side you inevitably upgrade its bad side as well. Those cards all go to a shared deck, so other players may get to use the cards you craft. At least they have to pay you for it. Mixed with all that is a healthy portion of worker placement. Card effects make you add workers to specific locations on the board or remove them from there. You’ll find yourself juggling workers from one place to the next to get the most out of your cards. And getting the most out of them is important: the players have to defend the city of Aegis where each of them leads a guild against a common threat while also competing for influence in the city. Now tell me where to send my money already! Grey Fox Games announced Reavers of Midgard as a Kickstarter for later this year, a single worker placement game in the same viking world as Champions of Midgard. Single worker placement refers to the fact that every player has one worker and they place it once per round. I guess that makes it a kind of action selection game. By placing your worker you activate an action space for all players and often trigger a draft of warriors, resources or battles. Your goal in all this: go out, pillage villages, bring back the most loot. More details soon! Okay, so mastering the Shards of Infinity to be able to reshape the universe sounds a bit like coming Marvel movies. That’s not bad, as long as it makes a good game. With a new deck-building game involving Justin Gary (Ascension,…), chances for that are good. Shards of Infinity has similarities with Ascension. Especially noticable is the ever changing row of six cards you can add to your deck. But there are changes as well. No longer will you be killing monsters, you win by attacking your opponents directly. Or you could win by gaining enough mastery points, but don’t think for a second the other players will just let you do that. Another exciting innovation is that cards you take from the center row don’t have to end up in your deck. You can play Mercenary cards immediately when you take them and use their ability – but then you only use them once. You don’t add them to your deck after, they don’t come back around every time you shuffle your deck. I can already tell that’s not going to be an easy decision. German publisher Pegasus Spiele have announced a worldwide license deal for new Talisman games with Games Workshop. However, none of the games they announced will be a new edition or expansion for the famous grandfather of fantasy boardgames. Instead there’ll be four very different games that explore the world of Talisman in different ways. The first to be released is the most surprising: a childrens’ game. Designed by Lukas Zach and Michael Palm (The Dwarves) it should still be a game to watch out for. It will be followed by an expandable card game, a dice game, and an RPG. The last one is the most expected to me. We’ll post more details on all the games as we get them. How can you be celebrating when the Red Death is coming for you? The new Kickstarter by IDW Games is Masque of the Red Death, based on the short story by Edgar Allan Poe. Players are nobles at the ball of Prince Prospero and they have two goals: be the most popular noble at the end of the night and be alive at the end of the night. Both goals need different resources. To be the most popular it’s popularity points, to survive it’s information where the Red Death will strike. Every round spent collecting one is a round neglecting the other, a fine balance is the key to victory. Until midnight Masque of the Red Death is an action selection game. With hand cards players move their nobles around and socialize. The other part of the game is programmed movement: until the clock strikes you can plan where you’ll go after it does. Then you better hope that you don’t cross paths with the Red Death, because dead nobles can’t win. Masque of the Red Death doesn’t sound like a very complex game, but it has a great mix of game mechanisms. A new X-Files game is coming from IDW Games. 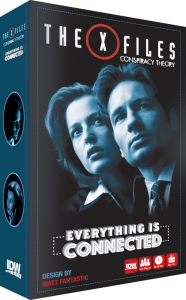 X-Files Conspiracy Theory – Everything is connected is not an expansion or sequel to IDW’s The X-Files but a completely different, independent game. A party game. With the evidence presented at the scene of a crime one player, in the role of Agent Fox Mulder, has to come up with a plausible (conspiracy) theory of what happened and convince the other players in the roles of FBI Directors. Let’s hope they don’t subscribe to “trust no one”. The underwater world of Abyss is getting more dangerous. In the next expansion sea monsters attack. In Abyss: Leviathan the borders are threatened by the monsters of that name. The threat track is replaced with the new border board and players will have to fight off the monsters, but the Conscripts and the new Lords might help with that. And at least there’s a new opportunity to score there.